Yosemite National Park offers a range of natural and cultural history programs that will enrich your experience while in the park. Check out the Yosemite Guide to see what programs fit into your plans. Artists of all levels and ages are welcome to participate in art classes at the Happy Isles Art and Nature Center. Art classes are held Monday through Saturday, 10:00 am – 2:00 pm. Advance sign-up is recommended. Suggested age: 12+ (adult supervision required for participants under age 18). For more information email artcenter@yosemiteconservancy.org or call 209.372.1442. Yosemite National Park offers a range of evening programs that will enrich your experience while in the park. Take a step back in time with a Yosemite Hospitality naturalist at The Majestic Yosemite Hotel. During this tour, you will explore the stunning décor, iconic landscape and architecture as you learn about the hotel’s unique history and how it played a role in the National Park Service history. When & Where Tour participants will meet at The Majestic Yosemite Hotel (near shuttle stop #3). Check in with The Majestic Yosemite Hotel Concierge Desk upon arrival. Please view the Yosemite Guide for the tour schedule and information. Private Tours Private programs are available with advance request for an additional fee. Contact Interpretive Services at 209.372.1151 to schedule a private tour. Participants Space is strictly limited to 30 participants. These tours are designed for adults and mature children. What to Bring Please dress for the weather including comfortable, close-toed footwear. In addition, please consider bringing water, hat, sunscreen, and sunglasses. Accessibility We can accommodate various special needs with advance notice. Assistive listening devices are available for those who are hard of hearing or, potentially, an interpreter for participants who are deaf. The tour is wheelchair accessible. If possible, please inform us of any needs before the program. Additional Information For more information about the hotel, please visit The Majestic Yosemite Hotel page. Junior Ranger programs are for kids aged 7-13 and include a one-hour Junior Ranger Walk, picking up a bag of litter to help keep the Park clean, completing an activity book ($3.50 plus tax)—and being rewarded with the official Junior Ranger badge. For younger children, the Little Cubs programs offers age-appropriate activities for kids ages 3-6. See the latest issue of the Yosemite Guide for additional details. Lively theatrical performances blend entertainment and education—and are always a hit with all ages. Performers create a show to remember, as audience members get to re-live the storied history of Yosemite National Park. Tickets are available through the Yosemite Conservancy Store at the Visitor Center and at Tour and Activity Desk at Yosemite Valley Lodge. Show dates are subject to change. Groups of 10 or more, please contact the Tour and Activity Desk at Yosemite Valley Lodge at 209.372.4386. Join a naturalist for a one hour stroll near The Majestic Yosemite Hotel. Topics vary, but all pertain to the park’s natural and cultural history. Topics include getting to know Yosemite’s trees, the inspiration of John Muir, and the dance between preservation and recreation. 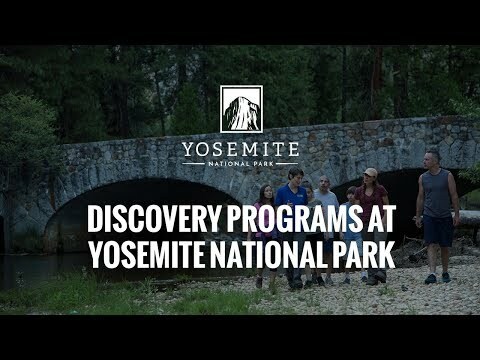 This is a free program offered by Yosemite Hospitality. This program, tailored to children ages 10 and under, covers Yosemite-related themes such as wildlife, plants, geology, or cultural history! Come join a naturalist for stories, crafts, and activities geared towards children. This free 45-minute program is offered at the Half Dome Village Amphitheater from May - October. See the latest issue of the Yosemite Guide for additional details. Led by informative and entertaining Yosemite Rangers, the free 60 to 90-minute walks typically include stories about the Park’s geology, first native people, early settlers and wildlife. The walks are offered in all areas of the Park depending on the season. Please dress for the weather and wear comfortable shoes. Some Yosemite Ranger Walks & Talks are wheelchair accessible; please view the Yosemite Guide for more details.